Thursday, Sept. 28, 6-8 p.m.
Third Thursdays Social Resistance Gathering is a new series taking place on the third Thursday of each month (although we have moved it to the fourth Thursday this month, due to the timing of Rosh Hashanah). The event is a chance for community members to come together, socialize, strategize, learn and recharge to continue the good fight protecting progressive values in Minnesota. Standing with Refugees and Immigrants in Minnesota in the age of Trump. 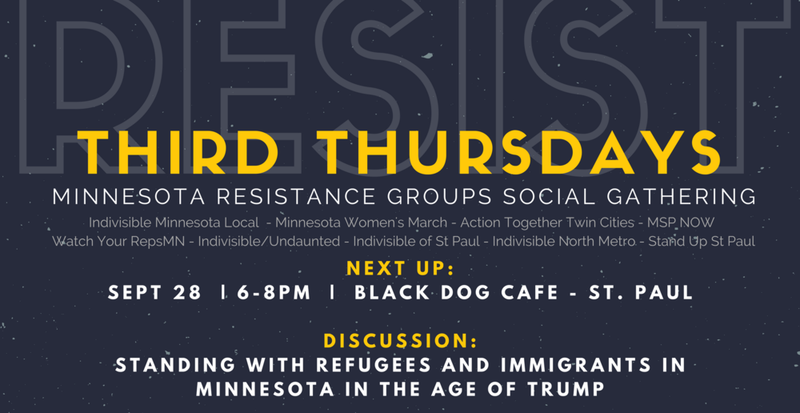 Join Women's March Minnesota and the Minnesota Resistance Coalition Thursday, Sept. 28, 6-8 p.m. at Black Dog Cafe for an in-depth panel discussion on refugee resettlement and immigration issues under the current administration.